The ancient parish of Llangernyw originally comprised the nine townships of Bodrach, Nannerth, Pantymanus, Pentrewern, Rhanhir, Hafodunos, Dwyafon, Branar, Marchaled and Bodgynwch, with a total area of 7200 acres. 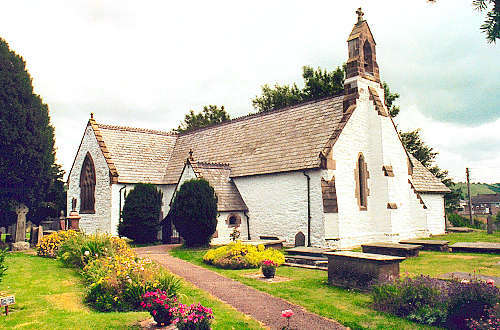 In 1867, the first three, and parts of the next three, with an area of 3100 acres, went to create the new parish of Llanddewi. The church is believed to date from the thirteenth century. Considerable restoration work took place in 1849, and again in 1881. The church is believed to have been founded in the sixth century by St. Eilian. It was restored in 1859 and 1903. For family history information about the church and parish, visit the GENUKI Llangernyw page.